Originally recruited from Warrandyte in Melbourne’s east, Hassall developed into a dogged and dour defender, and was renowned for his ability to stick to tasks set for him. 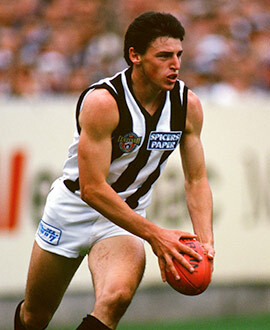 At Collingwood he was used as a tagger and he showed great concentration, using his pace to great effect. He took out the Harry Collier Trophy as Best First Year Player in 1994 along with the club’s Most Improved Player Award and was surprisingly let go at the end of the 1996 season. In his 1997 autobiography, Collingwood Forever, teammate and captain Gavin Brown described Hassall as a “very quick player, over short and long distances,” lauding Hassall’s courage and fondly recalling the day he ran back into goalkicking legend Tony Lockett’s path and even gave the great ‘Plugger’ a cork. He moved to Hawthorn where he was given a more open role, using the wide expanses of Waverley Park to advantage, and it was a surprise to many when he was delisted at the end of 1999 after 94 senior games.